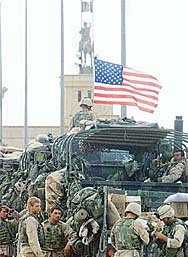 Tikrit, the hometown and last stronghold of Saddam Hussein crumbled with little resistance to the American forces, who rallied with the local police and officials to control looting and lawlessness in other “liberated” Iraqi cities today. Should the UN, instead of the US, take the lead in rebuilding Iraq? In an apparent act of political vendetta, Uttar Pradesh Chief Minister Mayawati today lodged nearly 200 cases against Samajwadi Party chief Mulayam Singh Yadav and others and instituted an inquiry in 35,000 other cases for alleged financial irregularities. Punjab Chief Minister Amarinder Singh, launching the party campaign on Baisakhi here today for the Panchayat elections, said the government was committed to giving the rural people uninterrupted power at cheaper rates. While presenting the first copy of the controversial Nanakshahi calendar to the President of SAD Mr Parkash Singh Badal, today, the SGPC chief, Prof Kirpal Singh Badungar, expressed satisfaction that like other communities, the Sikhs now had their own religious calendar, even as the Chief Minister. Capt Amarinder Singh, expressed doubts that the event could unleash chaos in the state. Thousands of trucks went off the road all over the country from today morning following an indefinite strike call given by the All India Motor Transport Congress in protest against the frequent rise in fuel prices and the proposed introduction of VAT. In a major setback to Congress leader K. Karunakaran, his faction's nominee Kodoth Govindan Nair was humbled by AICC-approved candidates Vayalar Ravi and Thennala Balakrishna Pillai in the Rajya Sabha elections held today. Satnam Singh Paonta Sahib, one of the five hijackers who took an India Airlines plane to Lahore on September 29, 1981, to avenge the arrest of Jarnail Singh Bhindranwale talked today about the hijacking and the four other hijackers who were directed by Switzerland to leave the country.